These important Cycle Enfield consultations – on the Haselbury area in Edmonton, and a quietway through the Firs Lane area including Barrowell Green – are due to close on the 7 October. Please submit your comments now if you have any connection or interest in the area. You’ll find both forms via the consultation hub. Haselbury shops will be better – but do we need more parking? We gave our response to the original, early engagement survey back in June, which you can read here. It includes many good features: rain gardens, traffic-calming measures for safer cycling, the Moores Brook walking link, and improved public realm around the shops on Haselbury Road. We can understand the pressure the council is under to listen to shopkeepers – but we feel that this change to the plans is detrimental, including to the businesses themselves. We believe it would benefit businesses far more to have as little parking and as much public realm as possible right outside their shops since this will be more pleasant for customers – plenty of research supports this. Parking spaces encourage drivers to slow and turn in the road in order to enter/exit them, increasing pollution. Parked cars introduce more danger to the many school children using the bus stop and shops at this location as they reduce drivers’ view of pedestrians trying to cross. In short, we would like to see the number of spaces directly outside the shops and bus stop cut drastically or removed altogether, with the exception of a couple of disabled bays. You can echo our response or give your own here. This new quietway link will join up Hoppers Road in Winchmore Hill with the Haselbury area in Edmonton. 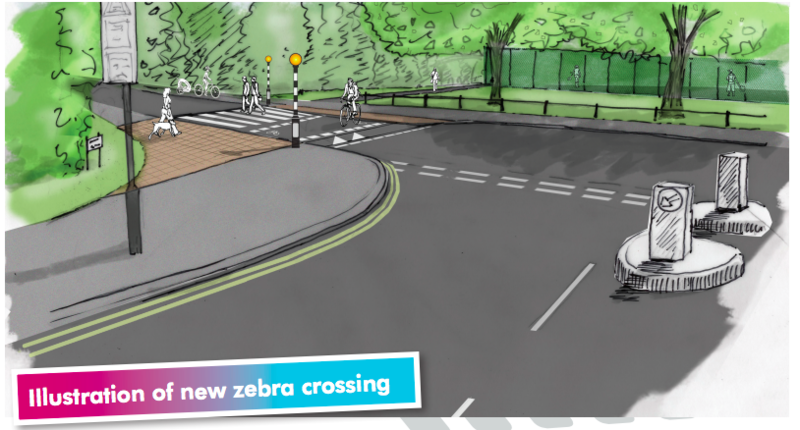 It will use the existing cycle/pedestrian crossing on Green Lanes into Barrowell Green, which will have a widened shared use pavement (i.e. bikes and pedestrians) from the recycling centre to the Firs Farm end of the road. From there, a new crossing (see picture) will lead into Firs Farm Park. Beyond Firs Farm, the route continues under the A10 by opening up an existing subway to cycling as well as pedestrians, and into the Haselbury neighbourhood. Changes to this consultation after earlier feedback include giving Barrowell Green a 20mph limit – a hugely welcome improvement. Another change is: “Subject to funding, there is potential for future footway widening to include space for cycling (with no loss of parking) between Green Lanes and the recycling centre”. This would mean unbroken, safe space for cycling all the way between Green Lanes and Firs Farm Park – much more reassuring for all ages and abilities. While 20mph is more effective over a wide area than just one road, this speed limit for Barrowell Green is a good start. The proposal to make space for cycling along the whole length of Barrowell Green could potentially boost cycling numbers on this route as it will both feel safer and be safe. We think it should be brought forward now as a priority, even if this means reallocating budget from elsewhere in the scheme. This scheme deserves your support – respond here.